Prompted by the run-away success of Video Now, the first ever kid-friendly, portable, personal video player, Hasbro's Tiger Electronics introduces Video Now Color coming this fall. In 2003 alone, more than 1.2 million Video Now personal video players and more than 4 million Video Now personal video discs were sold. Video Now was recently ranked the number one TV-promoted product in the toy industry by a survey of retailers and wholesale distributors conducted by The Toy Book, a leading toy industry publication. Building on the brand's amazing performance to date, Video Now Color combines the high caliber programming and easy portability of the original Video Now with an awesome colorful, ergonomic design, a larger, back-lit screen and improved video playback quality. Now kids and tweens can enjoy a bigger, better Video Now viewing experience - in Color. "Video Now is a hit and the only personal video player designed for kids and tweens with content available in stores for an approximate retail price of $8.99," said Brian Goldner, Hasbro's President, U.S. Toy Segment. "Video Now Color is the next generation of this highly successful platform and we will be launching with an incredible array of new content." Of course, the innovation Video Now Color brings to the tween marketplace is only as good as the library of content offered...and Hasbro continues to bring Video Now fans incredible programming, allowing kids to easily build their collections of their favorite shows and stars. Video Now Color will offer the hottest names in children's entertainment, featuring popular titles from Nickelodeon including SpongeBob Squarepants, The Amanda Show (starring Amanda Bynes), Fairly Odd Parents and Jimmy Neutron, as well as popular new episodes of ABC's America's Funniest Home Videos, NBC's Fear Factor, American Idol and TLC's Trading Spaces, among others. The Video Now Color proprietary color personal video discs will be available for approximately $8.99 each and $16.99 for three-packs with more content planned to follow at an approximate retail price under $5. "Hasbro has the personal video business for kids and tweens figured out," said Steve Youngwood, senior vice president, media products, Nickelodeon. "We look forward to taking our relationship to the next level with the major breakthrough introduction of Video Now Color." "Video Now was one of the industry's top innovations in 2003, and one of our strongest performers," said Wayne Yodzio, vice president, divisional merchandise manager at Toys "R" Us Inc. "Great content at a low price drove the success of Video Now and we expect Video Now Color to be even bigger." "Video Now Color has raised the bar in the world of electronic entertainment for kids," said Jim Silver, publisher of Toy Wishes Magazine. "With a vast collection of great content at a price that offers tremendous value, it's sure to be an item kids will be asking for." For approximately $75, kids this fall can have their very own Video Now Color personal video player to take with them anytime, anywhere. Video Now Color is backwards compatible - so the installed base of more than 4 million Video Now personal video discs, already in kids hands, will play on Video Now's next generation of hardware technology; each color unit will play both the new color personal video discs as well as the original personal video discs which will play in black and white. Additional full length titles now available include top rated Nickelodeon shows like My Life as a Teenage Robot, Danny Phantom, Rocket Power and All Grown Up. In addition, viewers can choose from action-packed episodes of Duel Masters, Transformers Armada, GI Joe, Discovery Channel's Shark Week and Monster Garage, Animal Planet's The Jeff Corwin Experience and That's My Baby. 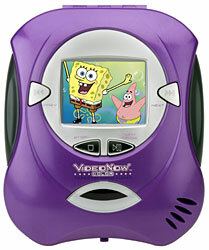 Video Now Color, a portable, personal video player with a color LCD screen (for ages 6 years and up) is scheduled to be available at leading national retailers in the fall of 2004 for an approximate retail price of $75. The line features additional software titles and a full line of Video Now Color accessories including a Video Now carrying case, deluxe backpack carrying case, Personal Video Disc Case, PVD Jewel Case, headphones and Car Adaptor. The Video Now Color personal video player features a self-contained speaker that delivers crystal clear sound. It also has DC power jack and headphone jack (DC adapter and headphones not included). And with just three AA batteries (not included) you can enjoy more than five hours of continuous entertainment.